Southwest Wisconsin is like Disney World for craft beer lovers. There are dozens upon dozens of craft brewing companies in and around the Madison area, some almost as soon as you get off I-90 or I-94. However, there are hidden gems tucked away in the rolling hills of the Driftless region beyond the state capital, so don't pass up the opportunity for a weekend beer tour to find Sunset Hill Stoneware's custom beer steins or coffee mugs. After all, some of these breweries are classics. As always, please enjoy these Mad City brews responsibly. 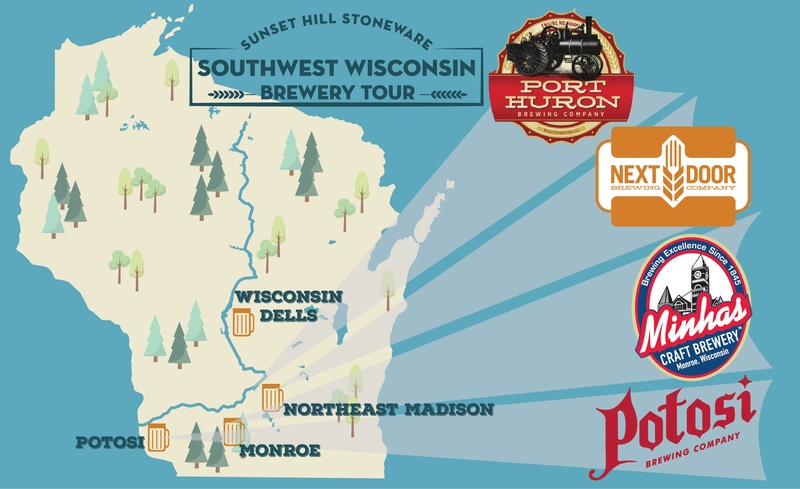 Located an arm's length away from downtown Wisconsin Dells, the family-owned Port Huron Brewing Company is named for a 1917 Port Huron Steam Traction Engine that the brewery's Brethorst family has owned since the 1950s. Port Huron produces a spectrum of eight different beers throughout the year, including several limited editions and seasonal offerings. The bestseller is the Honey Blonde, a blonde ale brewed with real Wisconsin honey. Even more, there's also the brewery's Amber Alt, which won the 2016 Silver Award from the Beverage Tasting Institute. Port Huron's taproom also has plenty of memorabilia to match their steam engine theme, including a stationary steam engine that powers a line shaft for air movement, plus engineering plans which were used at the Port Huron Engine and Thresher Company factory in Michigan. For beer connoisseurs and lovers of antiques, it's sure to be a treat. 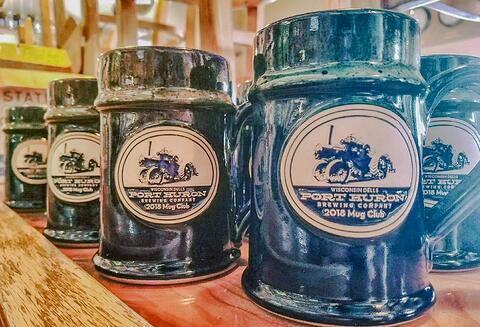 On top of their beer offerings, Port Huron Brewing Company has a mug club that is supplied with new Sunset Hill Stoneware steins every year in a different color and style. While the unique design changes from year to year, every piece of stoneware features the ubiquitous steam engine on the medallion. Ask about joining during your next visit. Just north of the Capitol building, Next Door Brewing Company has established a foothold on Madison's north side since 2013. Now they've grown even more, and officially began distributing their beer in stores and pubs all over Wisconsin in 2015. 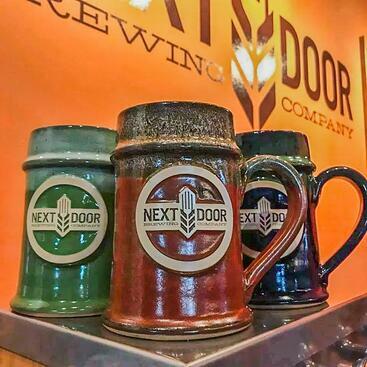 Next Door boasts five flagship beers, including the Bubbler blonde ale, Kaleidospoke American Pale Ale and Darth Porter in their year round offerings. However, they have more than a dozen other offerings available at different times of the year. During the summer months, you can find the floral-themed Livacious Saison, the Wheat Fork Hefeweizen and a coffee stout, plus many more. Next Door and its neighbors, Karben4 Brewing and One Barrel Brewing Company, have a unique mini-tour through Madison called the ALLDAY3WAY. To participate, ask for a punch card when you order a craft beer from any of the three partnering breweries. Then, go to the other two breweries to get your card punched at all three places. Doing this will win you an exclusive gift and give you a nice tour of the city. Next Door also has an exclusive mug club where you may be able to find Sunset Hill Stoneware products. But, the club has a cap of 60 people per year, so be sure to check for availability. 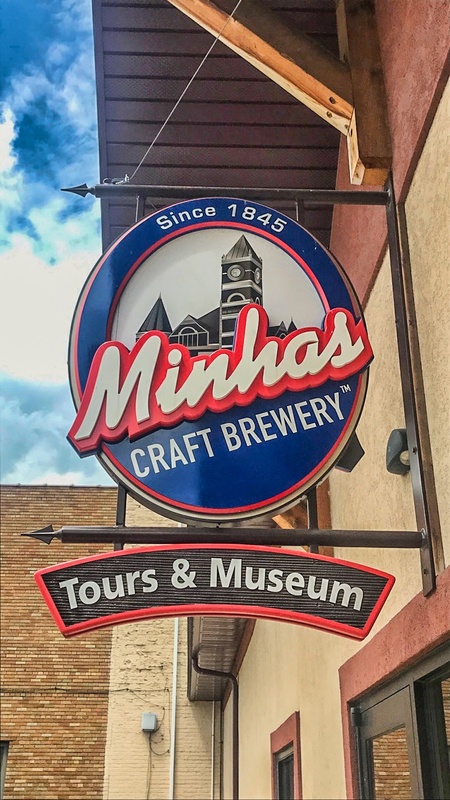 Minhas produces dozens of beers and malt beverages at its two locations in Monroe, but the crown jewel in their selection is the Huber Bock lager, which won silver at the World Beer Awards in 2014 and remains the most awarded beer at the brewery.Located in the little Swiss-American town of Monroe, about an hour south of Madison, Minhas Craft Brewery is one arm of the 11th largest brewery in the United States by volume. The company also owns a distillery for harder alcohol right across the street, plus a microbrewery located in Calgary, in Alberta, Canada. For those of us who prefer harder alcohol and spirits, Minhas Distillery provides a range of liquors including vodka, white whiskey, rum and moonshine. The distillery also offers tours through the facility, including a chance to learn how to mix cocktails made from the spirits produced right on site. While you're visiting Minhas Craft Brewery, be sure to ask about Sunset Hill Stoneware custom coffee mugs and look for them among their merchandise offerings. 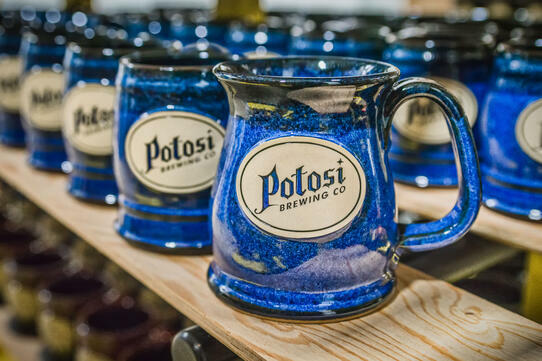 Strategically found as far west from Madison as you can go without ending up in Iowa, Potosi Brewing Company is the village of Potosi's worst-kept secret, found right along the Mississippi River on Great River Road. We've been supplying them with our steins and mugs for years, so there's a good chance you'll find one to take home as a souvenir during your visit. Potosi Brewing Company has five core beers available year round, including the ubiquitous Good Old Potosi. During the summer, their selection includes the Steamboat Lemon Shanty and Wee Stein Wit. There are even more brews available during other seasons, so paying them a visit could potentially always result in a different experience. While you're visiting the brewery, you'll also be able to tour the museums located at the same site. The American Breweriana Association (ABA) National Brewery Museum displays brewery collectibles from across the country including beer bottles, coasters, advertising materials and more. Admission to the ABA National Brewery Museum is $5, or $12 for the all-inclusive brewery and museum tour with beer tastings. The brewing company also hosts the Great River Road Interpretive Center and Potosi Brewing Co. Transportation Museum. Through these exhibits, guests can learn more about the history of the Mississippi River and of Potosi Brewing Company, with carts and other displays showing how they distributed their beer throughout the years. Admission to this museum is free.